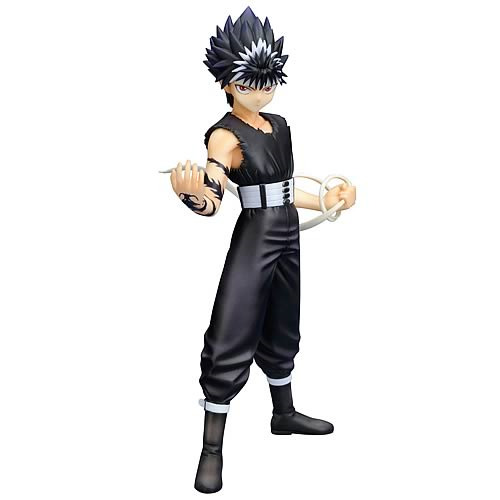 Your favorite character from YuYu Hakusho in ArtFX form with the YuYu Hakusho Hiei ArtFX J Statue! Exquisitely detailed statue stands 8-inches tall. Statue comes with alternate arms, including one with a black dragon curled around it! Kotobukiya is proud to combine a classic manga and anime property with a hot new statue format with the YuYu Hakusho Hiei ArtFX J Statue. First up is the fiery demon born to an Ice Maiden, Hiei! The warrior and swordsman stands in a relaxed martial arts pose, his right arm extended as he focuses his supernatural energies. He wears a black and white fighting outfit complete with boots and wide multi-layered belt, while a white strap wraps around his left hand. Hiei's demonic heritage is apparent in his red eyes and jet black hair with white fringe, and you can display him with either of 2 included faces with or without the evil Jagan eye. He also comes with alternate arms, one with the black dragon tattoo and the other with the black dragon itself curled around it. Sculpted by Hideaki Kiyohara, the YuYu Hakusho Hiei ArtFX J Statue stands 8-inches tall (1:8 scale) and goes perfectly with the YuYu Hakusho Kurama ArtFX J Statue (sold separately). Created in 1990, the original YuYu Hakusho manga series ran for years and was then adapted to anime on TV, telling the tales of a student who is brought back from death to serve as an Underworld Detective fighting supernatural crime. Now the great characters from YuYu Hakusho are coming to you in the ArtFX J Statue series, a bold new expansion designed to bring classic Japanese characters to their fans worldwide. Ages 3 and up.